Happy February! We’re thismuch closer to spring now! And we’re thinking warm and cheery thoughts today with this fun rainbow wedding cake. 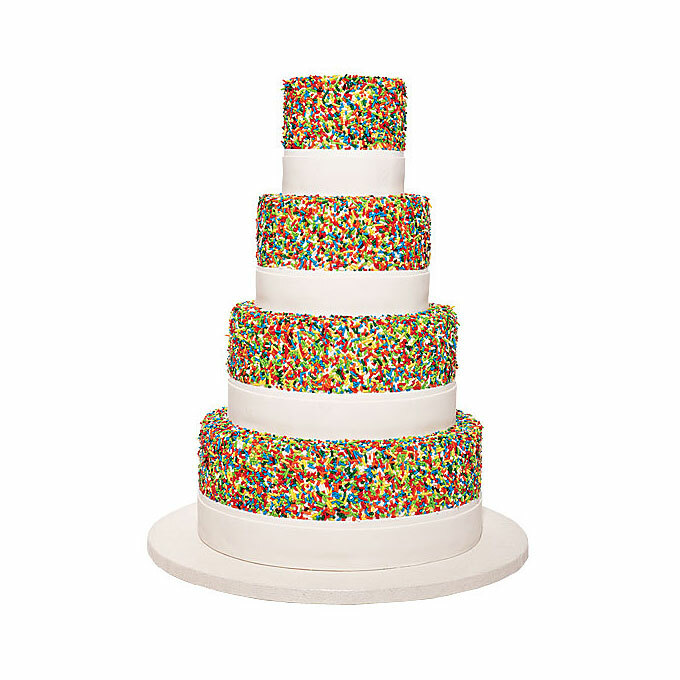 Who needs a plain ol’ white wedding cake when you can add sprinkles for some fun and whimsy? I love the idea of using rainbow sprinkles to add a touch of color and fun to your wedding cake. It’s a very clever way to add color without being too over-the-top. Plus your guests will never expect a wedding cake topped with sprinkles! No need for any other embellishment on this cake – the sprinkles do all the work. All you and your guests need to do is enjoy the cake. A cute and modern cake topper would be perfect on this cake too. You can find this cake here. It was created by Cheryl Kleinman Cakes.